Do cats become bored? If your cat is a couch slouch then boredom may not be a problem, but some cats are better described as party animals! These cool cats know how to boogie and if they don’t get enough brain input, their behaviour can be cat-astrophic! Boredom is most common in confined cats which is a problem because keeping cats limited to roaming at home is becoming vital — for many good reasons. Bored cats are easily recognised — exhibiting varying behaviours such as hyperactively racing through the house like a fur-covered lightening bolt, especially at night. Sound familiar? A bored cat will delight in a game of ‘rough and tumble,’ but if there’s a shortage of toys or entertainment, it will happily use fingers and toes as a chew toy. Commonly, bored cats hide under furniture with eyes as big as dinner plates. The moment you walk innocently past, they scoot out and latch onto your leg, firmly embedding claws and teeth into your calf. Just as quickly they detach and race back to their hiding spot, laying in wait for the next encounter of the furred kind! For a cat, the inside of a house is a sterile environment compared to the joys of cat-apulting freely through suburbia. The more a cat can roam, the more stimulated it is by the refreshing newness of its territory. Every new joy discovered by a cat becomes its own reward which, in turn, stimulates further exploration. So, how do you cat-er for the needs of a bored cat? Get your cat its own Catmax home entertainment system! 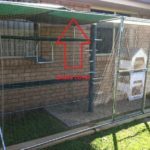 Provide an Outside Play-Gym Confined cats are much happier if they have a semi-outside play-gym that they can access via a cat door. 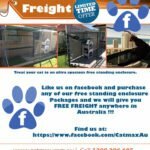 Catmax is Australia’s leading designer and constructor of cat enclosures such as the freestanding Caboodles® and fixed Clearnets®. Clearnet is almost invisible, you can tastefully enclose a veranda, balcony, full or partial backyards and incorporate trees as part of a purpose-built play-gym. Catmax recommends providing areas for feeding, resting, toileting and exploration. The key to keeping your cat’s attention and interest is to change the ‘furniture’ regularly. Cats prefer to exercise by stretching, jumping and climbing rather than running long distances. Therefore elevation is more important than floor space. Catmax caters for this with accessories like pet houses, catwalks, climbing poles, scratching posts, steps, ramps and hammocks. Cat enclosures can be creative and attractive solutions for bored cats. Catmax are cat management specialists, who can tailor an innovative ‘outdoor room’ to suit your home, budget and your cat’s requirements.